“Whaaaaaaatt! 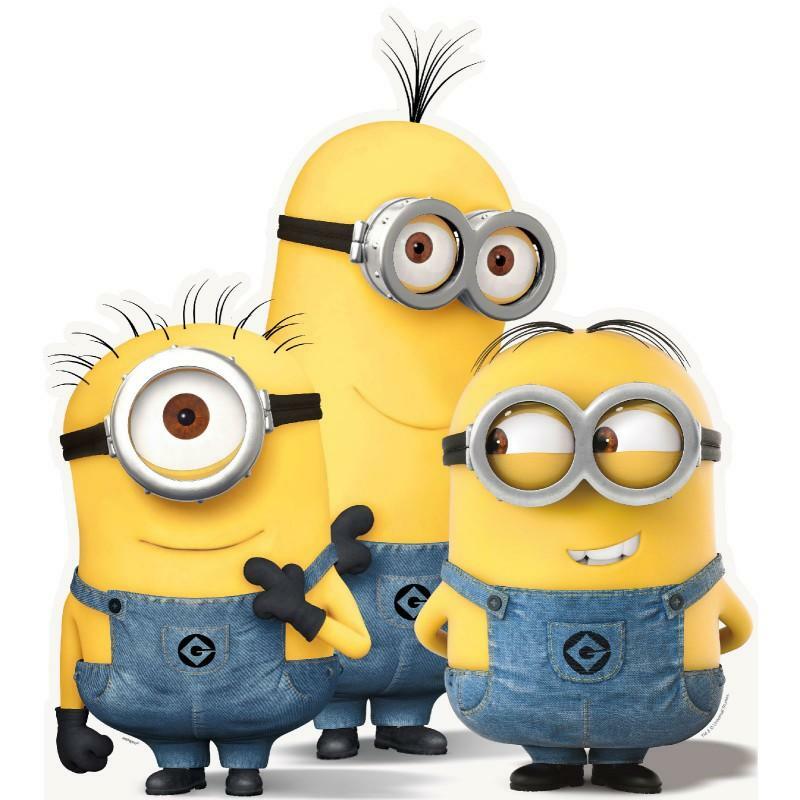 ?” Everyone finally realized they were the real stars of the Despicable Me movies — and the real reason those two films made over $1 billion combined dollars at the worldwide box office. Yes, that’s one BILLION dollars. With a “B.” Yeah, go ahead and give yourselves a round of applause, guys. 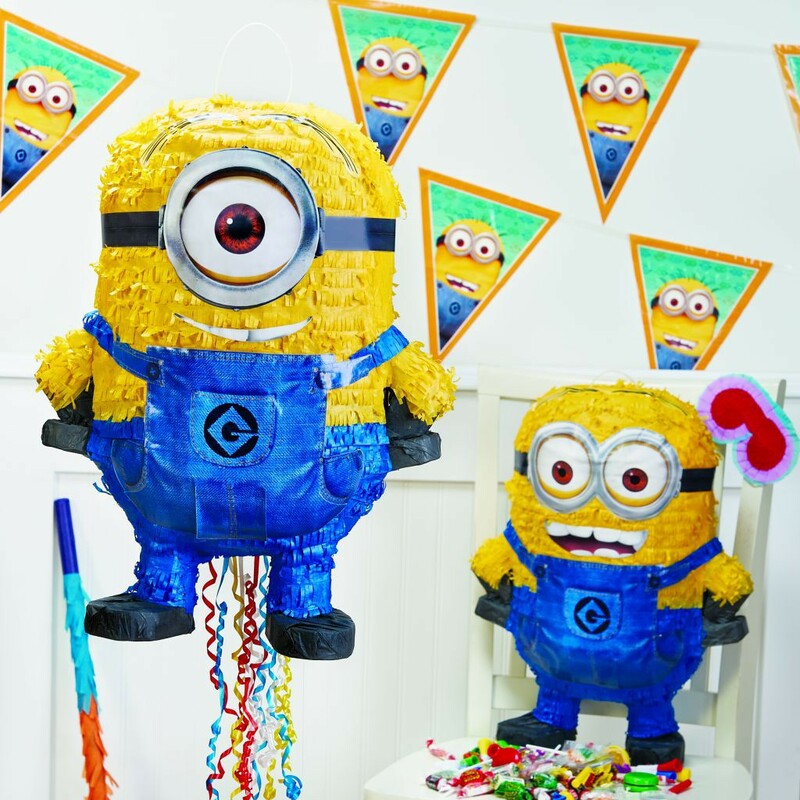 Check out a bunch of fun DIY Minions projects for the party! And click here to see a Top 10 list of crazy amazing Minions cake ideas! The key to a great Minions party is strength in numbers. The more Minions, the better! And our plates, cups, napkins, and more are simply plastered with those little guys! 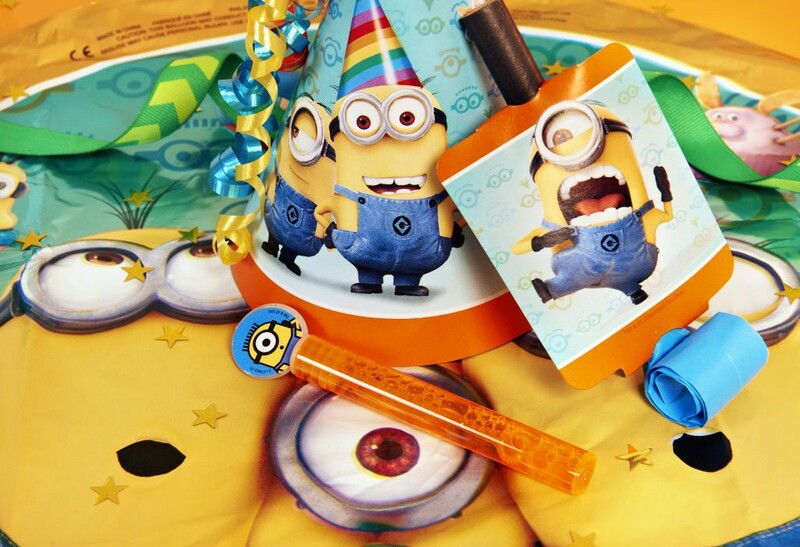 Our Minions Party Pack comes with everything you see below. All that stellar tableware is great, but it’s even better when the table it’s topping is topped with a tip top tablecover. Confused? Don’t be. 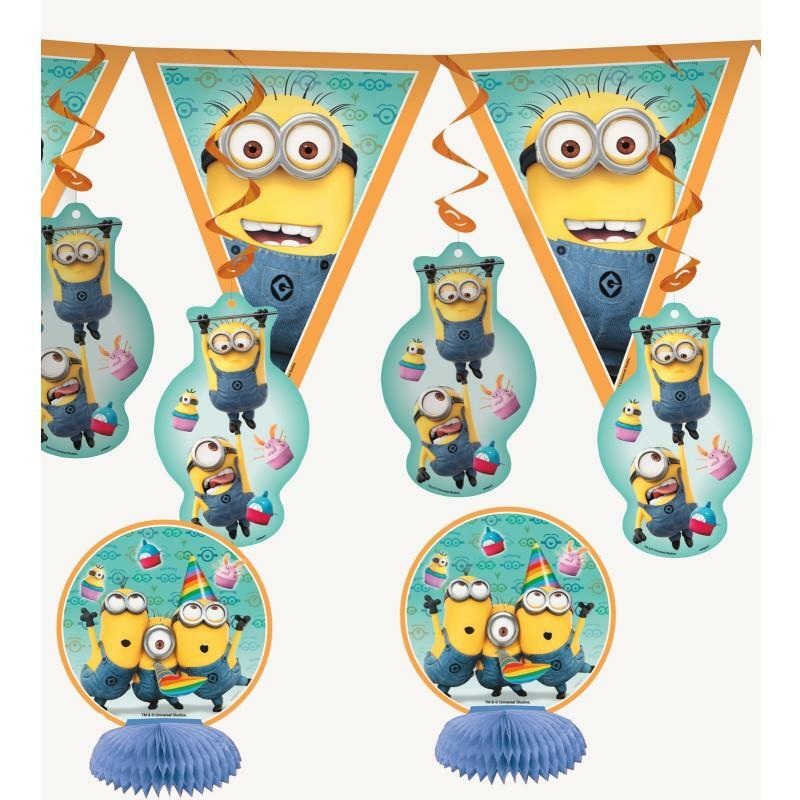 We’ve got just two pinatas here, reduced down from ALL OF THE PINATAS, plus we’ve featured this great Minion pennant flag banner, which comes as part of this awesome decoration kit. And this door poster lets everyone know they’ve come to the right place to party down. A welcoming figure if ever there was one! 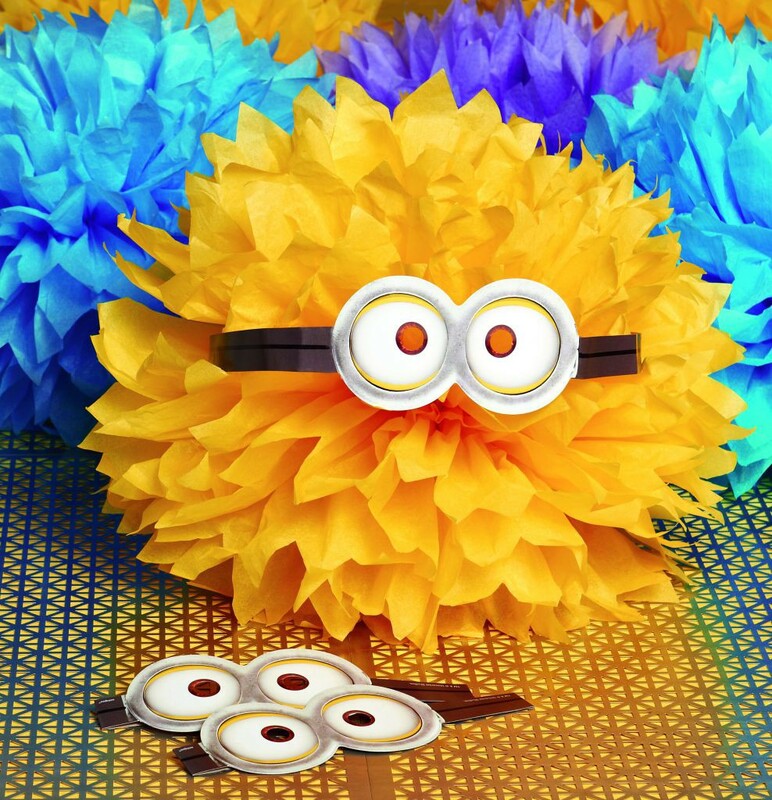 Throw a paper goggle mask on a yellow fluffy decoration and you’ve got an instant DIY Minion. 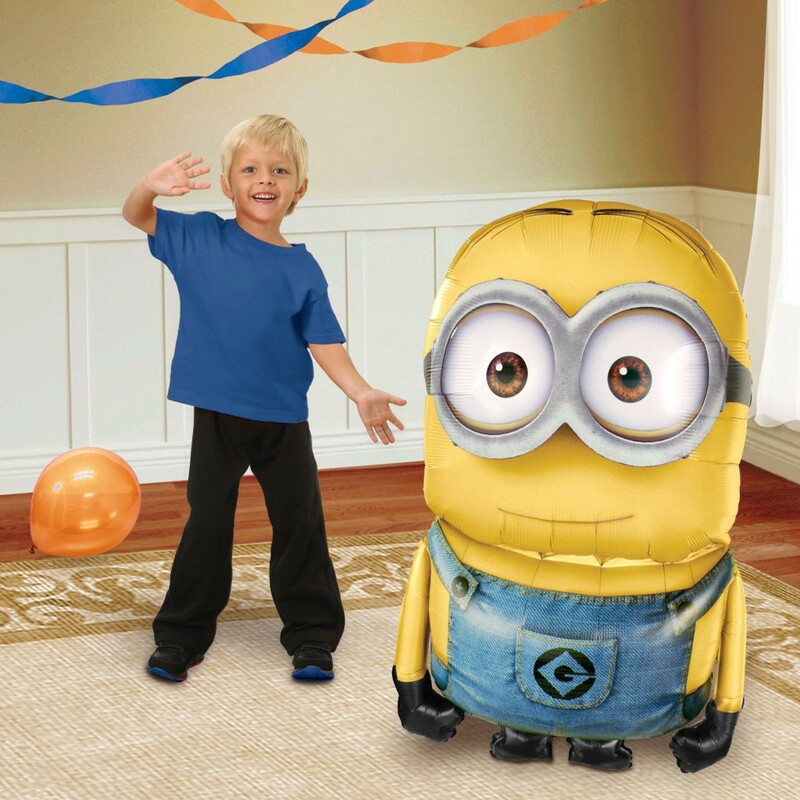 But when it’s time to pull out the big guns, you’ve simply got to go with this giant Minion airwalker balloon! It’s 3 feet tall! Real life Minion size. 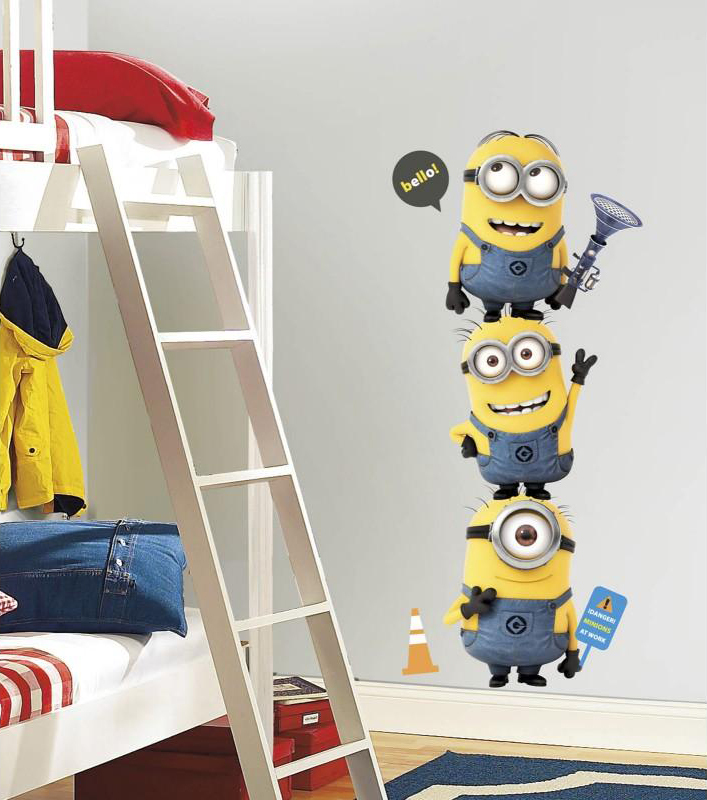 And speaking of tall, check out this awesome giant wall decal set. 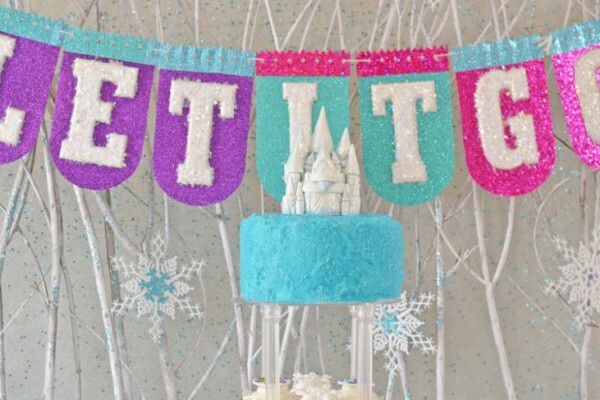 It’s fully removable, so you can put it up in the birthday kid’s room after the party’s over. It’s a decoration and a thoughtful gift all in one! 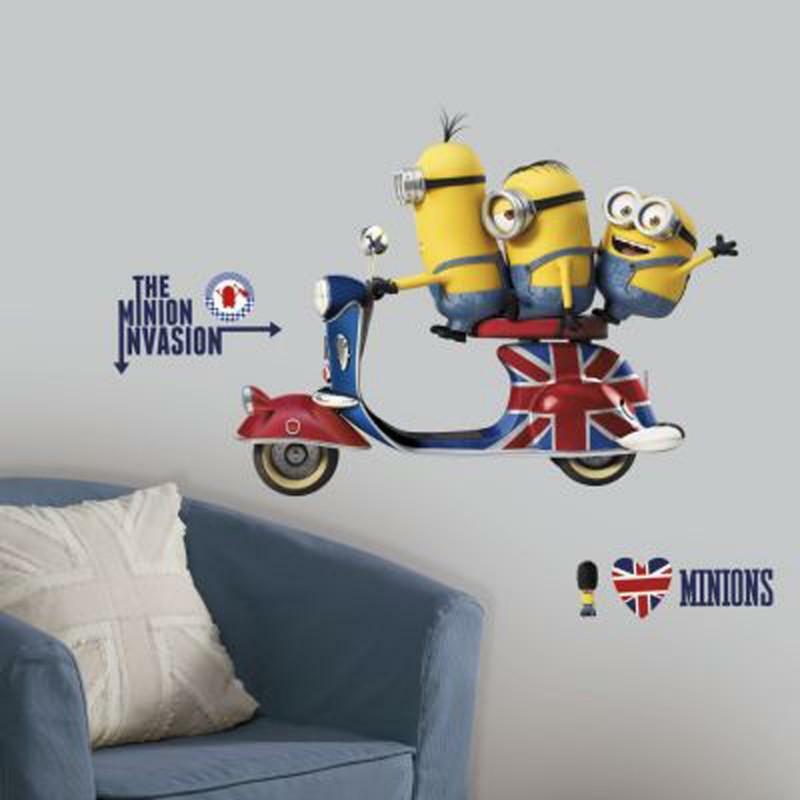 And it’s not the only wall decal option we have available, either. And just in case you’re running out of wall space, take a peek at our awesome cardboard stand-up. The guests can pose for pictures with these cute little fellas, then you can send them out with the Thank You notes as a little memento of what was surely the party of the year! 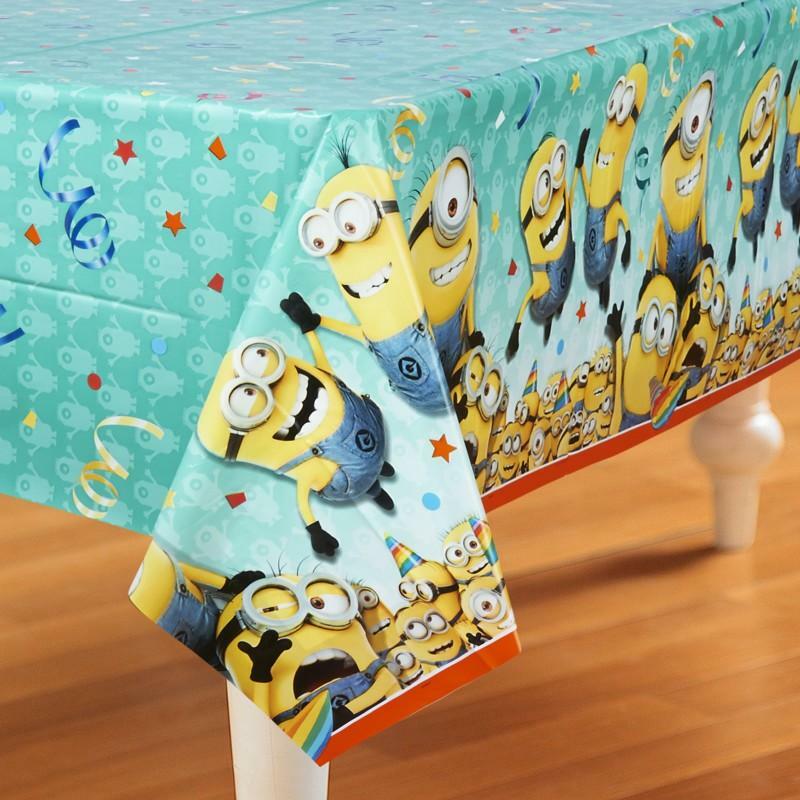 If you’re going to dress up the party setting in everything Minion-related, then dress up the kids, too! 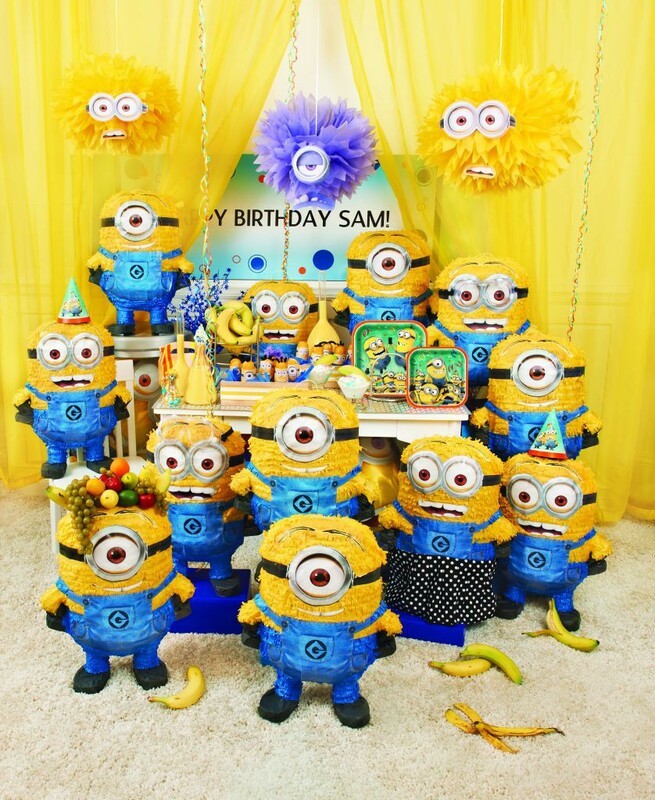 The guest of honor can wear a special Minion costume on his or birthday. They’ll look just like the characters from the movies. Paper Minion goggles can also be handed out to every kid. 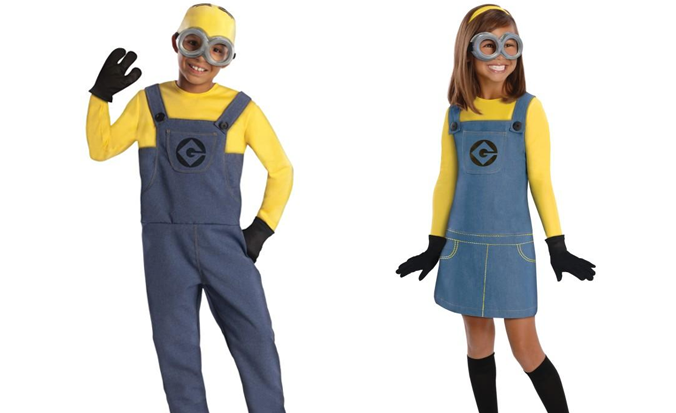 Shop boys Minion costumes, girls Minion costumes, and more at our dress-up section. 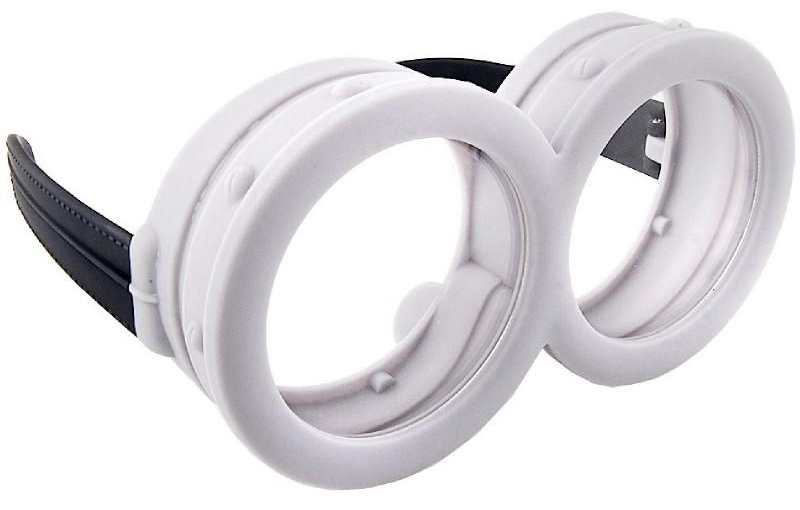 Or, you can turn any yellow and blue ensemble into a suitable Minion outfit with these plastic goggle accessories! Minions even come in the canine variety! Why not? Everyone say it with us – “Awwww!” Apparently, the minions are is so popular that they even transcend species boundaries. Dress up your best friend in this for the party, and the kids will love it even more than their own costumes! 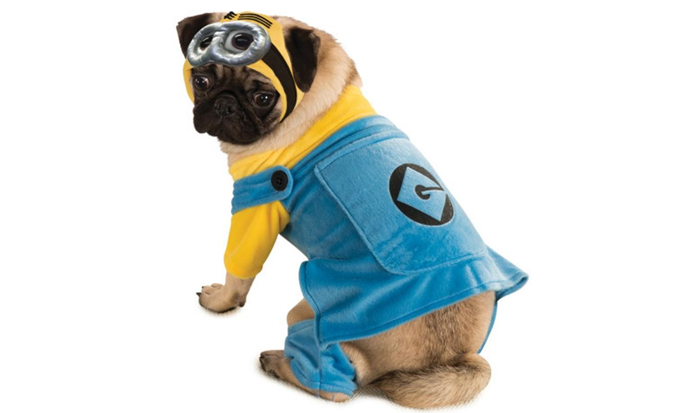 Click here to get your own dog Minion costume. 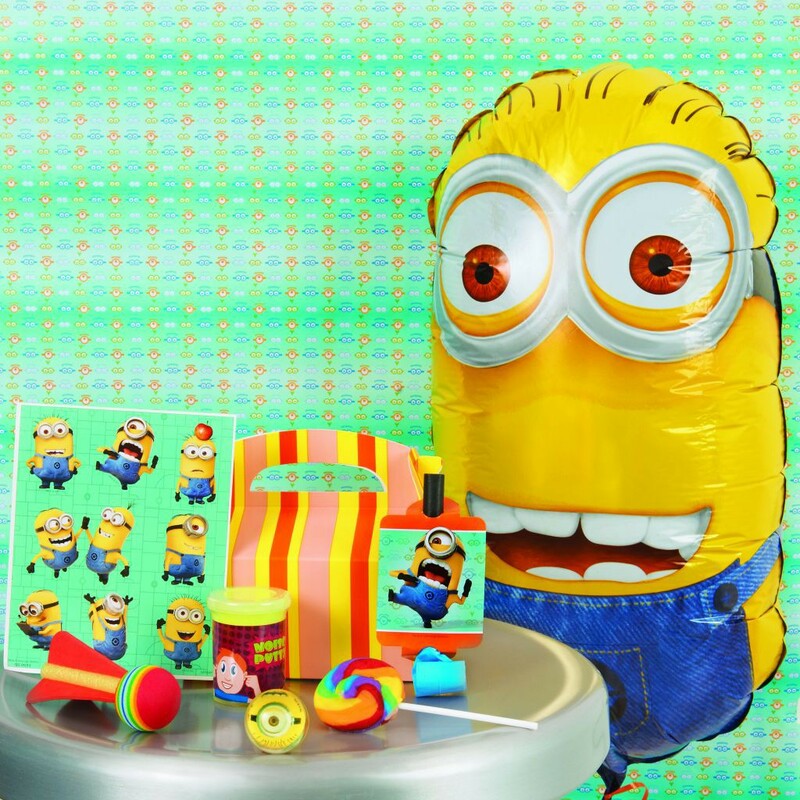 Credit goes to MySkoop for yet another great Minions party idea! This one couldn’t be quicker or easier. 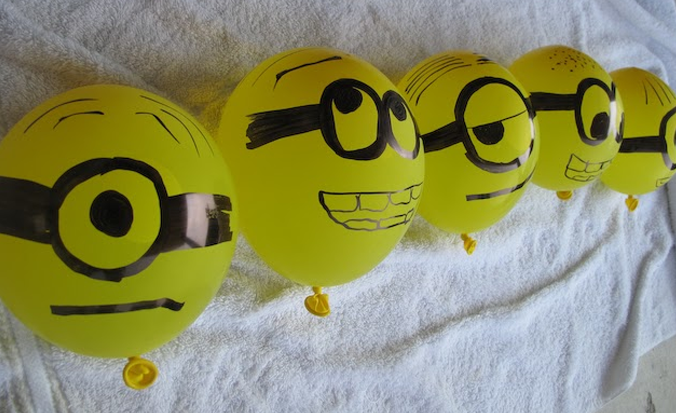 Just inflate some regular latex yellow balloons (with air, not helium) and use a black permanent marker to add faces. 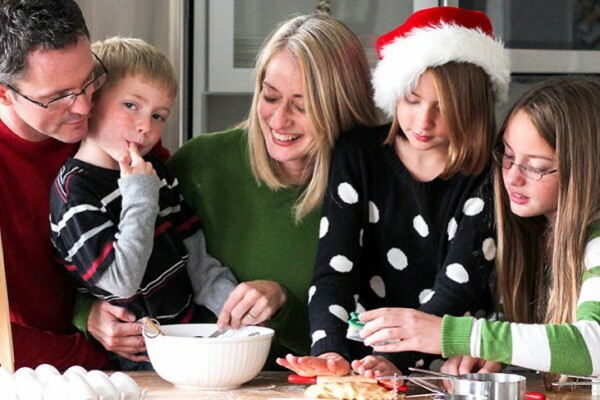 Be as cute and creative as you want – the kids can help out and lend their artistic talents as well. 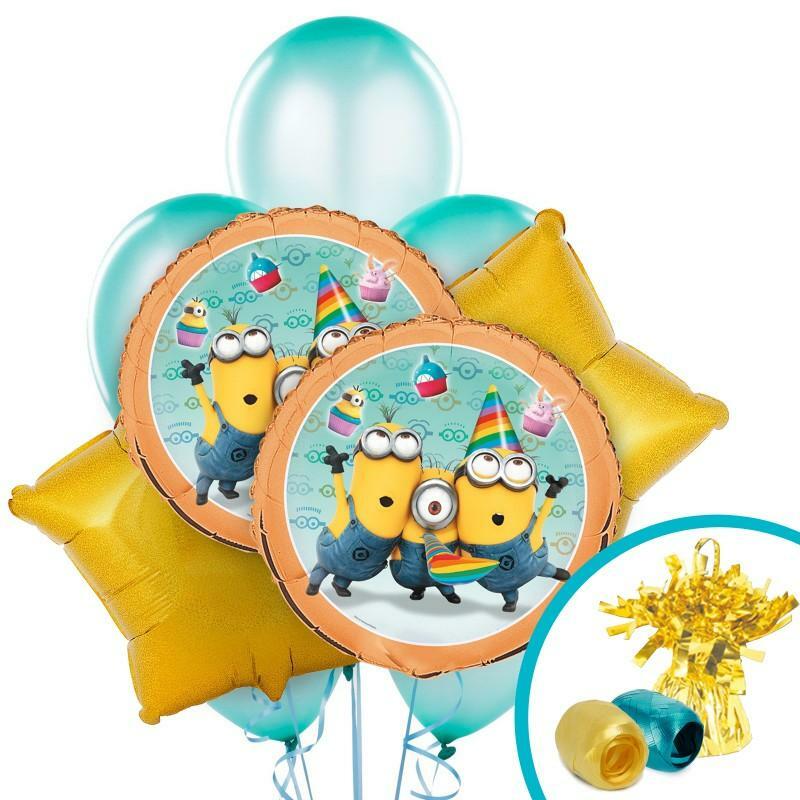 Bat around your minion balloons in a fun volleyball game, or just use them as decoration. Play a game of Minion bowling. 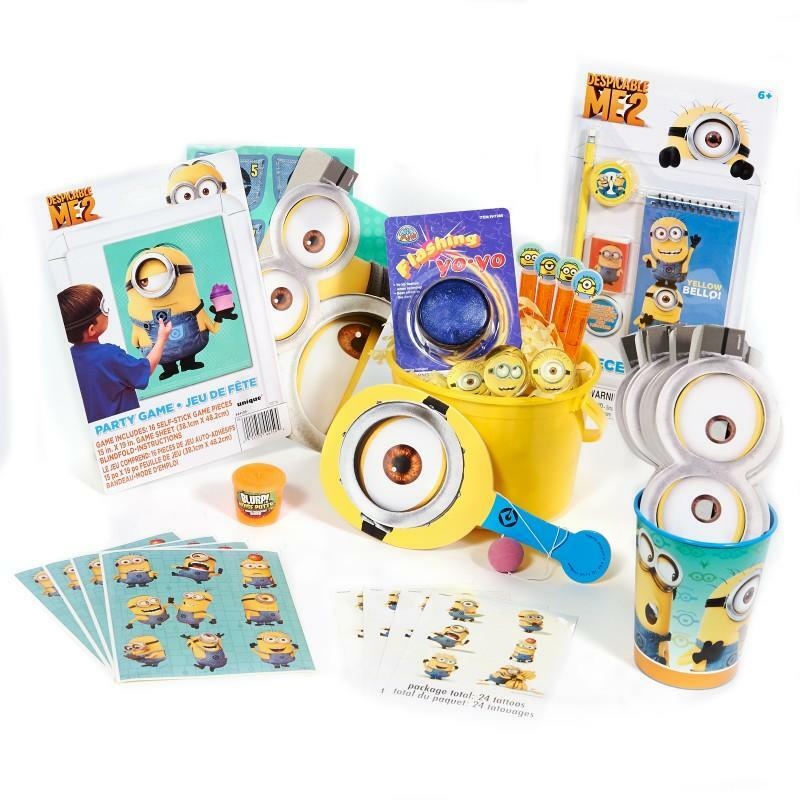 This Minions party game was created by Emilie at Plucky Momo. Visit that link for the full tutorial on how to make your own. She painted some empty 2-liter soda bottles with blue and yellow spray paint, then made them look fully Minion with some paper goggles and marker mouths. A set of six is suitable for bowling pins – which child can knock over the most? Extra fun with food and favors. 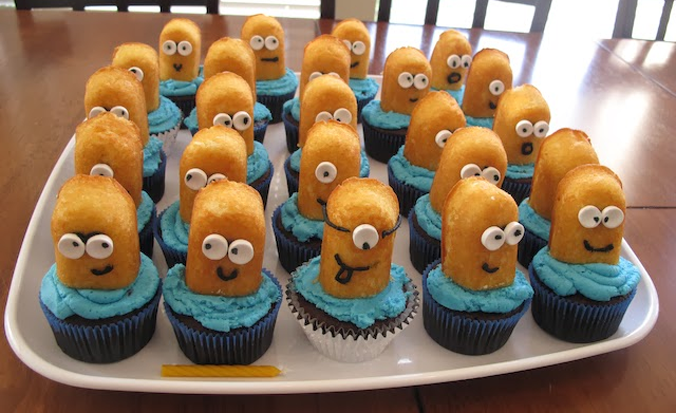 This cupcake idea is so perfect, it’s like Twinkies (or your favorite generic equivalent) were specifically made the purpose of making mini Minions. 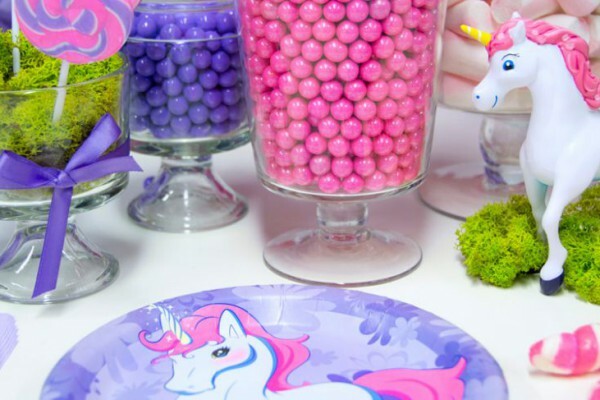 To make and decorate your own batch like this, all you need to do is split a bunch of Twinkies in half and stick them onto some frosted cupcakes as shown. Use white round candies for the eyes, and either decorator’s frosting or a food coloring marker to draw the faces. to this phenomenal favor bucket! 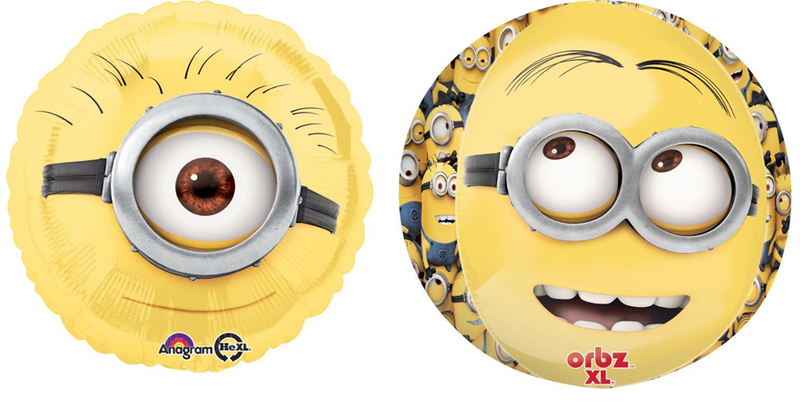 Are your little helpers huge fans of the Minions? 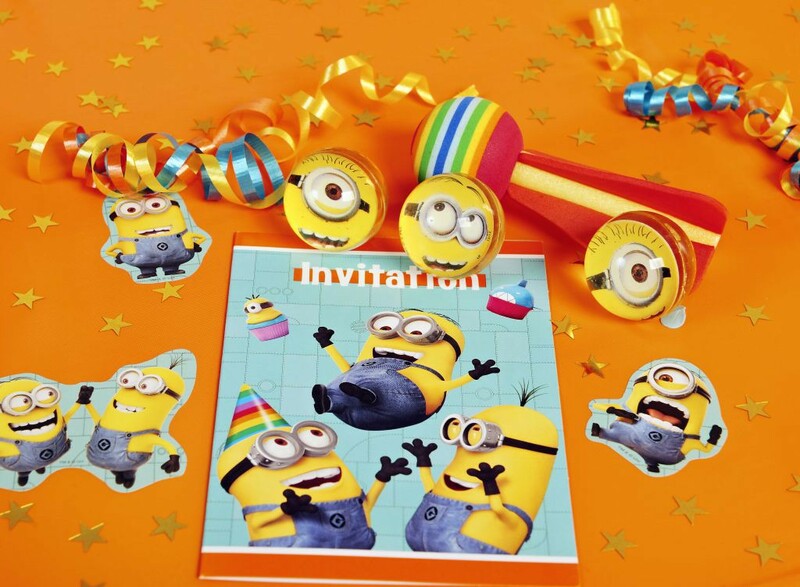 Are you inspired to throw a Despicable Me birthday party to celebrate their next special day? 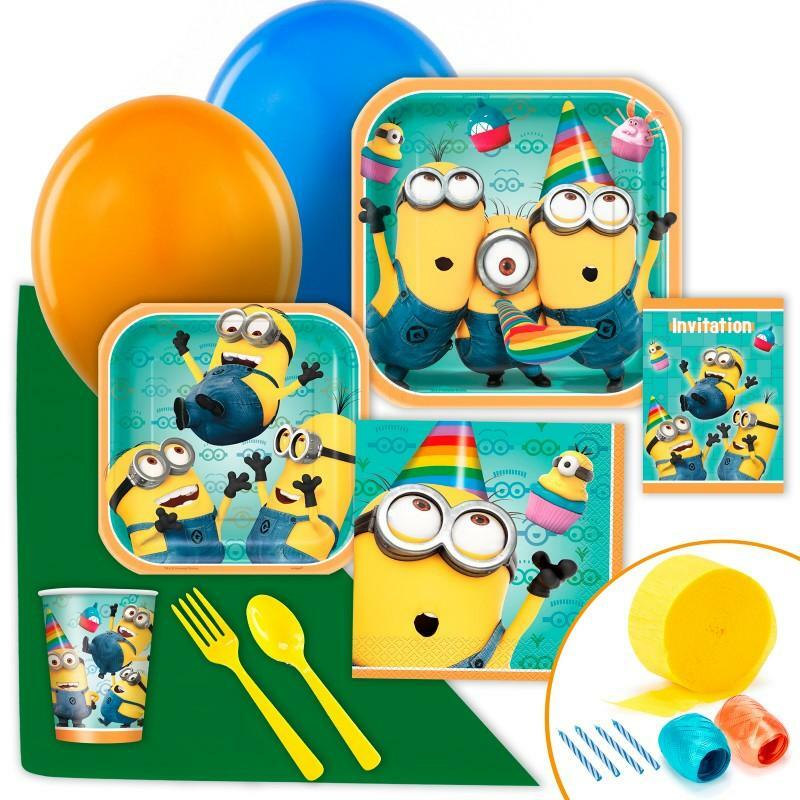 Click here to see all of the awesome Minions party supplies at BirthdayExpress! 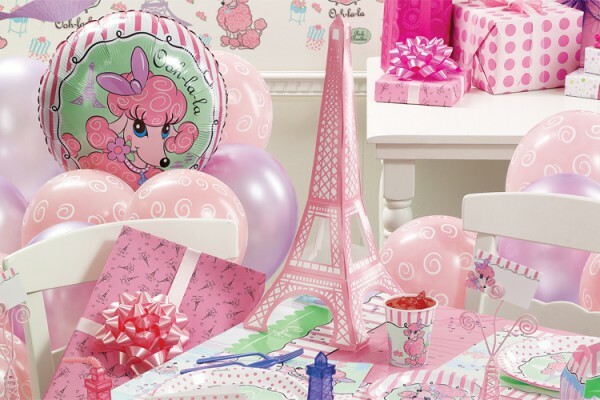 Click here to view more Pink Poodle in Paris.